The guy in this article absolutely fits my definition of a hacker. There was a problem where two radio stations were broadcasting the same syndicated content on the same frequency. Listeners near either station had no problem. However there were locations where both signals could be recieved. This would be fine, except for the fact that the cable running to one of the stations was longer than the other, so the signal was delayed by 1/23000 of a second. Enough to cause destructive interference. So the engineers solution was to create an acoustic delay line out of 23 feet of lead pipe stuffed with cloth and gauze with a speaker on one side and a microphone on the other. The slower speed of sound delayed the signal long enough for the two stations to be in sync. The catch was that radio waves travel with the speed of light, 186,000 miles per second, and sound waves only 1,080 feet per second. Therefore, the answer went, the listeners three thousand miles away would hear it first. However, in the actual broadcast of a speech from, say, New York to San Francisco, the tripper-uppers would find themselves tripped. 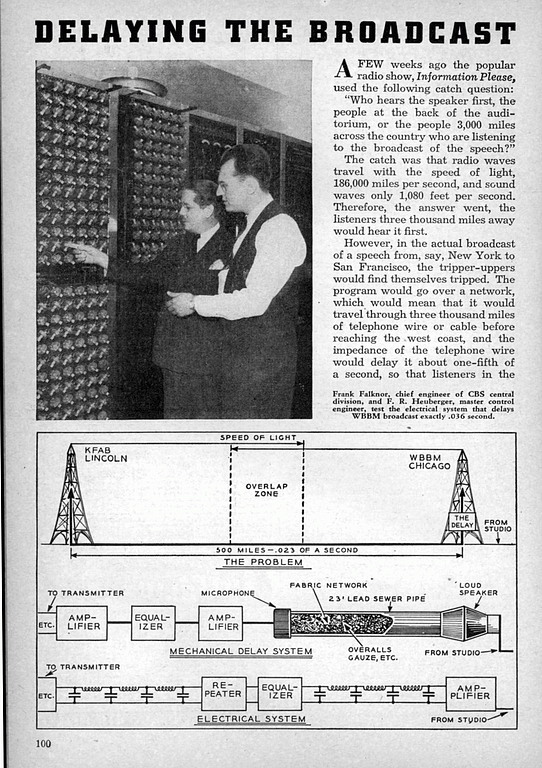 The program, would go over a network, which would mean that it would travel through three thousand miles of telephone wire or cable before reaching the west coast, and the impedance of the telephone wire would delay it about one-fifth of a second, so that listeners in the auditorium would be the first to hear the speaker. This characteristic property of wire and cable caused many a headache for the Columbia Broadcasting System when station WBBM in Chicago and KFAB in Lincoln, Nebraska, were synchronized on 770 kc. There was a strip fifty or sixty miles wide about midway between the stations where their signals overlapped, so that a set tuned to 770 kc. would pick up both stations. It was a simple matter for the engineers to match the frequencies exactly so that listeners would not be bothered with squeals or howls. But the line running from Chicago to Lincoln delayed the Lincoln broadcast by twenty-three thousandths of a second, while radio waves themselves traveled with the speed of light. As a result, the program from KFAB would reach the listener twenty-three thousandths of a second later than the same program from WBBM, enough to cause a hollow tone about the same as you would get if you yelled into a barrel eleven feet deep. Frank B. Falknor, chief engineer of Columbia’s central division, undertook to solve the problem. It boiled down to a question of delaying WBBM’s broadcast exactly twenty-three thousandths of a second, and doing it without spoiling the tone quality. There was no equipment anywhere to do the job, and development of an electrical delay system was a matter of months. As a stop gap he rigged up an ingenious mechanical contraption, warranted to make Rube Goldberg green with envy. He started with a section of lead sewer pipe, twenty-three feet long. It would take a sound wave twenty-three thousandths of a second to pass through it. 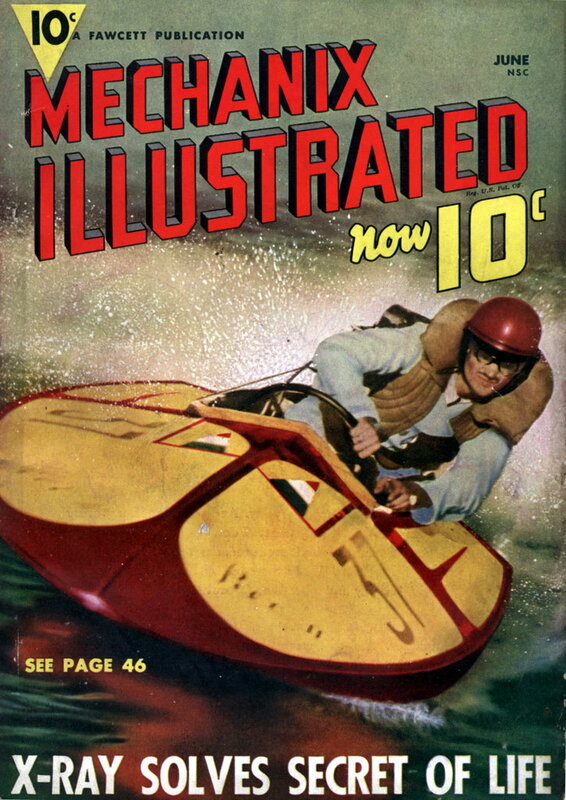 At one end he put a dynamic loud speaker, fitting it to the pipe with a matching unit that would permit the sound waves to feed into the pipe without echoing. This speaker was connected to the studio microphone, or to the incoming wire from an eastern network program. At the other end of the pipe he mounted a dynamic microphone. So far, so good. He had produced the necessary delay. But when sound waves hit the mike some of them bounced right back. When they met the waves coming from the speaker they produced a series of beats or humps that ruined the program, making it worse than the barrel tone they were trying to kill. To choke these echoes he installed a network of cloth in the pipe, starting with gauze near the center and using heavier and heavier fabrics as he approached the mike end. The final pieces were chunks cut from mechanics’ overalls! This equipment worked fairly well, but there were still a few humps that the fabric network was unable to kill, and the total volume was reduced. Accordingly, volume was stepped up with an amplifier, and the humps eliminated by a series of equalizers, one for each hump, with an amplifier between each of them. The contraption worked like a charm. Programs started going through it at the same instant they started over the wire to Lincoln. By the time it had bounced down the pipe, passed through the equalizers, and reached the transmitter, the corresponding impulse was leaving the antenna in Lincoln. Its fidelity was fairly good, with accurate results over a tone range from 100 to 5,000 cycles. The electrical system now in operation has even greater fidelity, covering the range from 50 to 6,000 cycles. It is made up of electrical filter sections, equalizers, and amplifiers. Each filter section delays the impulse by an infinitesimal fraction of a second, but in so doing reduces the volume of some tones far more than others. Hence, it must next go to an equalizer, which levels the volume for all tones, but actually cuts total volume. Next it is fed through an amplifier, then to another filter section, etc. In actual practice twenty sections are needed, the delay required now being thirty-six thousandths of a second because of a new cable installed between the two cities. It’s 529 times (23 squared) more, isn’t it? But that’s not important. The use of the gradient from gauze to overalls – THAT”S cool.